1. Temple Management reserves the right to change the services donation guidelines without notice. 2. If you don’t see the name of the pooja, please Contact Temple or Priest Directly . 2 Sai Baba Thursday Annadaanam Devotee can check available date in the temple Donate $725 for one Thursday Only . 3 Shri Sai Astottara Pooja For Lord Ganesh, Saibaba, Hanuman, Sri Raja Rajeswari, Sri Maha Lakshmi and other Gods. 7 Sri Sai Pushpa Astottara Pooja Pooja will be performed with fresh Flowers. Needs two days notice to order fresh flowers. 13 Sri Sai Pushpa Maladhaaranam Includes the Sri Sai Astottara Pooja,includes Flower garland. Needs one week notice to order flower garlands. 22 Sri Sai Paduka Abhishekam Abhishekam will be performed with Pancha Amrutams. Temple is looking into this option . * Pooja on special occasions: wedding day, birthday, memorial day praying for success etc. 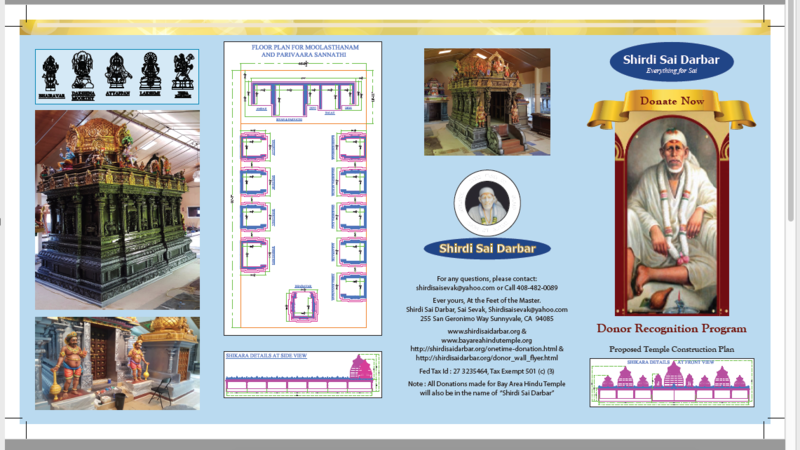 For Token of $2001.00 You will have the honor of sponsoring the “Shirdi Sai Darbar & Bay Area Hindu temple’s” operation for a day. 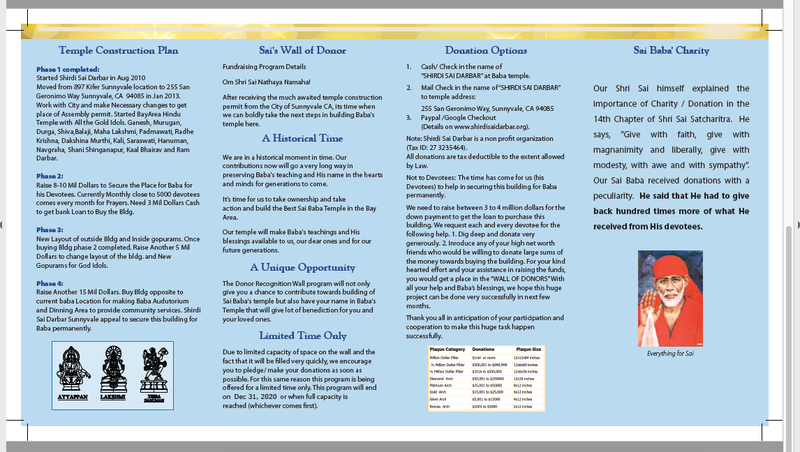 Sametime you will be automatically part of the Bronze Wall of Donor program also. On any day of your choice.